Say what you want about Oreos, but no one can argue they haven't been putting themselves out there. From celebrating their own 100th birthday in March, to posting a picture of a rainbow-colored "Pride" cookie on their Facebook page in June, to coming out with a seemingly endless stream of new flavors and styles, the century-old brand has taken great pains not to become stagnant in today's market. 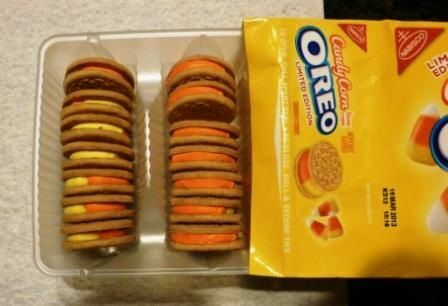 Their latest effort on this front is the Candy Corn Oreo, released on September 10. As far as tastiness goes, new Oreos flavors tend to range from solid successes (what up, Birthday Cake Oreo?!) to utter failures (here's looking at you, Berry Burst Ice Cream). Given this unpredictability, I was curious to see how candy corn, a candy with an already ambiguous reputation, would fare. Upon opening the package ($2.99 at Target, 21 cookies in a pack), a powerful scent of candy corn wafted up at me. 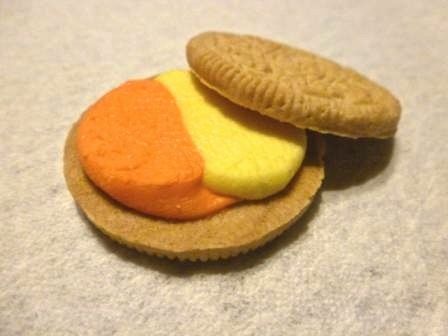 With the top cookie removed, the creme on the Candy Corn Oreo looks a little like a smooshed-down piece of candy corn -- a half yellow/half orange circle sandwiched between two vanilla cookies. I took my first bite of just the creme, and was immediately struck by how sugary it was. I tried hard to conjure up an impression of candy corn, but all I could get was a strong vanilla frosting flavor and enough sweetness to make my hair stand on end. Taking a bite of the whole cookie together made it taste a little more like candy corn, perhaps because the two golden wafers tempered the sweetness of the frosting. But still, the overall impression I got was vanilla. Although these Oreos look like candy corn and smell like candy corn, they don't really taste like candy corn. That doesn't mean they're bad, though. A die-hard candy corn lover might be disappointed, but your average Halloween party-goer will love these cookies. 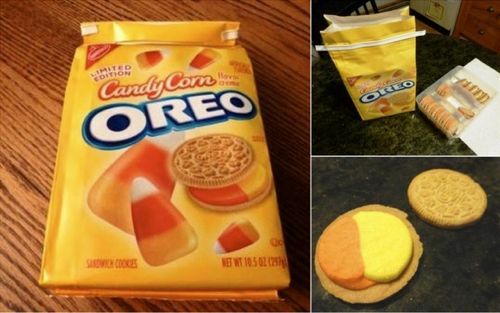 And judging from the already half-empty Target shelf I got these from, the Candy Corn Oreos are going to sell. Once again, Oreo has tested and proved the formula sugar + holiday theme = success. Cheers, Oreo. Here's to breaking out of the mold without really breaking out of the mold and having enough years of customer satisfaction under your belt to do whatever the heck you want.